The sublime Tanya Tagaq should be on anyone's short list of 2014's most noteworthy Canadian musicians. Over the course of five electrifying minutes on stage at the Polaris Music Prize gala, Tagaq pretty much graduated to single-name recognition, and that was before she even won the big prize. Her well-deserved breakthrough has been years in the making and we haven't seen anything yet. 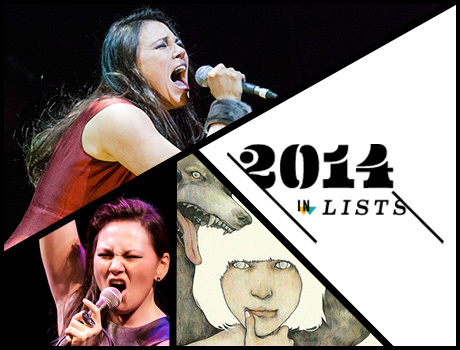 Read our four reasons why Tagaq went big in 2014 below, but don't forget to visit our 2014 in Lists section to see more of our Year-End coverage. Tagaq was already well known across Canada thanks to an early career collaboration with Björk and steady exposure in national media. But the groundwork from Cambridge Bay via Halifax to the rest of Canada was laid through this country's network of concert halls, jazz and world music festivals. Her success has been an end run around well-known indie and major Canadian labels until her recent alliance with Six Shooter provided opportunities to charge square into the middle of mass consciousness. First Nations and Inuit artistry is undergoing probably its greatest visibility ever within Canada at a time when modes of expression are at their most diverse. A Tribe Called Red, Kinnie Starr and Nelson Tagoona are just a few who are redefining traditions with contemporary relevance. This is most definitely not happening on the same scale in the U.S., and few places in the world — perhaps Chile, Mexico and New Zealand — are seeing such a widespread creative renaissance among Aboriginal musicians that also captures the imagination of a wide swath of non-Aboriginals. This current attention is one of the greatest effects of #IdleNoMore. In some ways, it's easier for journalists to write about Tagaq's primal energy, volcanic sexuality and explicit politics than it is to describe her music. That's because her music remains rooted in free improvisation, which is a tough assignment for anyone used to writing about more predictable rhythms and structures. Her most frequent collaborators, Jesse Zubot and Jean Martin, are vital components to her music. "Jesse and Jean are very masculine and very respectful to women and very good natured and so powerful — but really calm about it," Tagaq told Muskrat magazine. "They don't need to claim their power by dominating." Zubot's Drip Audio label and Martin's Barnyard Records are responsible for some of the finest yet most polished experimental music produced in Canada over the last decade, and their methods in turn extend Tagaq's ideas. This kind of conversation takes years to develop and will just get deeper and more thrilling as time goes on. "I don't want to see people being abused and I'm sick of it. I'm mad, I'm yelling about that, I'm yelling about being sexually abused, I'm yelling about all the pain that people are having to go through, I'm yelling about all of this stuff," Tagaq told UBC School of Music. Just as the "energy music" created by John Coltrane or Albert Ayler is impossible to separate from the rage surrounding the civil rights struggles of the '60s, Tagaq's deeply felt ferocity channels the horrible realities of murdered and missing indigenous women (#mmiw), systemic racism and environmental catastrophe in this country. It is consummate pop music in its own way, giving voice to emotions most of us wish we could articulate.